It's been almost a week and I survived my "Riding the Google Wave" session at NYSCATE's "Riding the Digital Wave" session out at Erie1 BOCES West Seneca location. It was a great day starting off with the keynote by Dr. Roger Firestein who started off by telling us he got his major in Creativity and Innovation here at UB! What? I've never even heard of that. He kept us thinking and in particular had us form groups and "without judgement" brainstorm ideas about what we'd want our bathtub to be! It was amazing when there were no limits what we came up with. From NASCAR strips that you could just rip off and BAM, the tub and area around it would be clean. To having the water do a skin scan and sending that information directly to your doctor to make sure everything is OK (thanks @rickweinberg for both of those). I keyed in on the idea of "without judgement" since I was going to be showing Google Wave, which is still in Beta, and quite honestly, Wave's been beat up quite a bit since it's release. In my session, well, I survived! I must've been pretty nervous because I can't distinctly remember where people were sitting, just that it was packed. 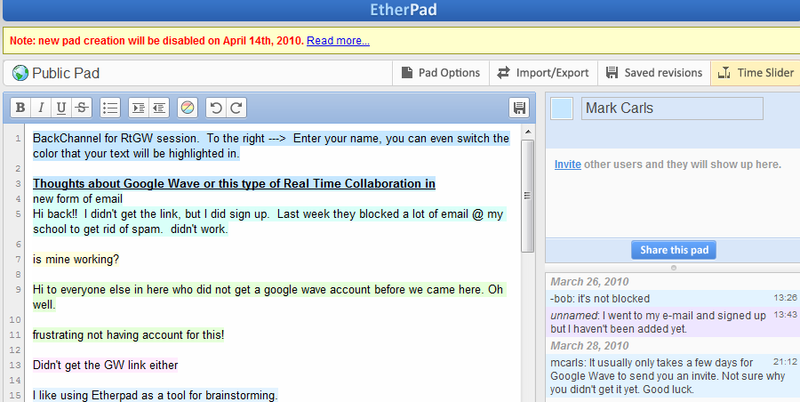 Quite a few people said they had Google Wave invites, but we only had a few editing with us. I fortunately could call on @tclarkeee, @jgriffith2, @theresagray and @rickweinberg as well as some others to add content and ideas. 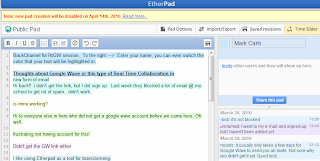 To give the others an real time collaboration option, I set up an Etherpad to use with suffix RtGW (Riding the Google Wave). I then realized that this one is different because it has lower case letters here! Ooops. The good things that I believe I did was to organize my waves into one folder (RtGW). That gave them a blue box when they were in my inbox denoted by RtGW. I also brought in the Public Robot (public@a.gwave.com) otherwise no one would be able to see it OR I'd have to invite every single person. The other robot I used was EasyPublic (easypublic@appspot.com) not sure if it did anything different, but I read that it wouldn't go away. I guess sometimes the Public Robot does? THEN, I tagged each of the waves #RtGW and to be safe also RtGW. This is done at the bottom of the wave where it says Tags" and a + sign in a grey ellipse. and get my four waves. For some reason the Fourth wave didn't show up and that was too bad, because I had questions about the opening keynote. Instead I started back over to wave #1 and deleted my content to put questions up for the keynote. You can see it here (If you have a Google Wave account). I tried to show the Google Wave that JamieLynn Griffith did with her 2nd Graders and their Community project, but I was trying to rush through all of it and by that point, I'm not sure how many people were still with me. I'm glad I took the risk, but couldn't done it a lot better. First, in the description, sent everyone to https://www.google.com/ to sign up for an account before they got there. I did try to send an e-mail a week before, but some didn't get it in time and didn't have time to send it in and get it back. This would've been the biggest improvement, because I think there was so much confusion at the beginning that it was hard for people to see how they may use this. I also should've gone slower at the beginning for those that had Google Wave accounts. This is how you start a wave, this is your blip. Shown ways to edit and save a little slower. Maybe had them send waves to a small group next to them to practice...then thrown them into mine to have all of us start adding to. Then, I could've organized gadgets better. I had my third wave all full of gadgets to play with. I barely talked about them. Not sure if I'd do that again. At least not until it's out of Beta and I get to use it more. Next, maybe something more like Google SketchUp!